Dine with us and sample the culinary talents of our chefs within our uniquely appointed dining rooms. Ranging from casual to fine dining each of our dining rooms offers a diverse menu selection featuring seasonally and locally sourced products. Whether you're treating yourself to an evening out, participating in one of our dining promotions or joining us for a special holiday menu (offered each Easter, Mother's Day, Father's Day, Thanksgiving and Christmas) our innovative and delicious menu options will be sure to impress! On Sundays, throughout the year, we're pleased to offer our famous Sunday Brunch which offers a gourmet selection of breakfast favourites. Our market fresh Sunday Brunch buffet features made to order omelettes, fresh Belgium waffles, assorted fresh salads, an exceptional selection of hot items, freshly baked cakes, pastries and pies. Why not leave the work of putting together a delicious Easter celebration to us this long weekend? 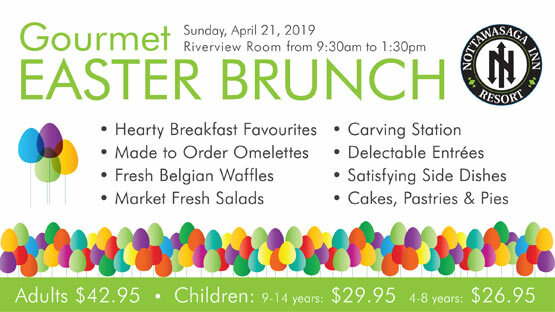 On Easter Sunday, between 9:30am and 1:30pm, join us in the Riverview Room for beautiful views and a delicious brunch buffet. This scrumptious feast features a wide selection of festive favourites expertly prepared by our team of chefs for your enjoyment. Click to view our Easter Brunch menu. Why not leave the work of putting together a delicious Mother's Day celebration to us? 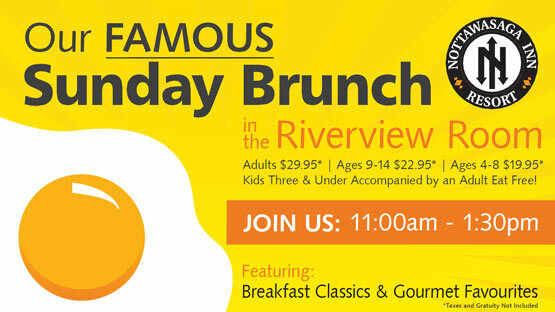 On Sunday May 12, between 9:30am and 1:30pm, treat your Mom to the Best Mother's Day Brunch she'll ever have. Our delectable brunch buffet features made to order omelettes, assorted fresh salads, an exceptional selection of hot items, freshly baked cakes, pastries and pies. Reservations are not required. Looking for the perfect gift? Treat mom to a variety of options by getting her a gift card. A relaxing massage is perfect for a mom who's into health and wellness, while an active mom is sure to love a round of golf with the family. Cards are available for purchase at the Front Desk, Gift Shop and in our Golf Pro Shops. 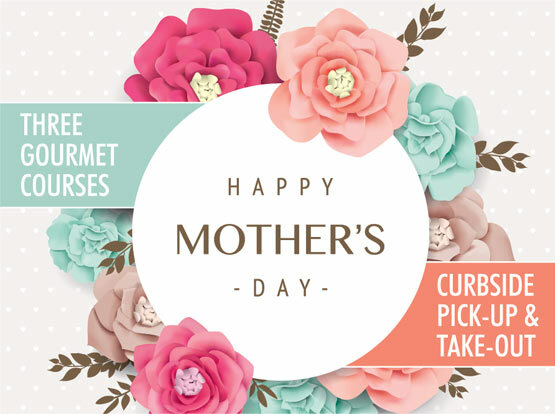 Make this Mother's Day one she won't forget!